Fairfield Ludlowe’s Colin Wilson scrambles against Greenwich during the first half on Oct. 24. To say Ludlowe football was at a low point in 2016 is kind of underselling it. The team went 0-10 , playing in front of mostly empty bleachers with a roster that resembled that of a Class S school rather than the LL school Ludlowe is. In fact, when Mitchell Ross took over as coach in 2017, he inherited a roster of 22 players. He was able to add a few players through in-school recruitment and the team won a game in his first season though they still finished as the last-place team in Class LL at 1-9. This preseason, the roster is topping out at close to 100 players. Of course, with increased numbers comes players lacking in experience on the football field. Storylines: You would expect New Canaan junior quarterback to be among the best in the state. You may not expect the same about Ludlowe’s Colin Wilson, yet it is Wilson sitting atop the state it yards passing among reported leaders on MaxPreps. Wilson leads the state with 2,264 yards while Pyne is currently sixth in the state at 1,742. His 24 touchdown passes are good for third in the state. 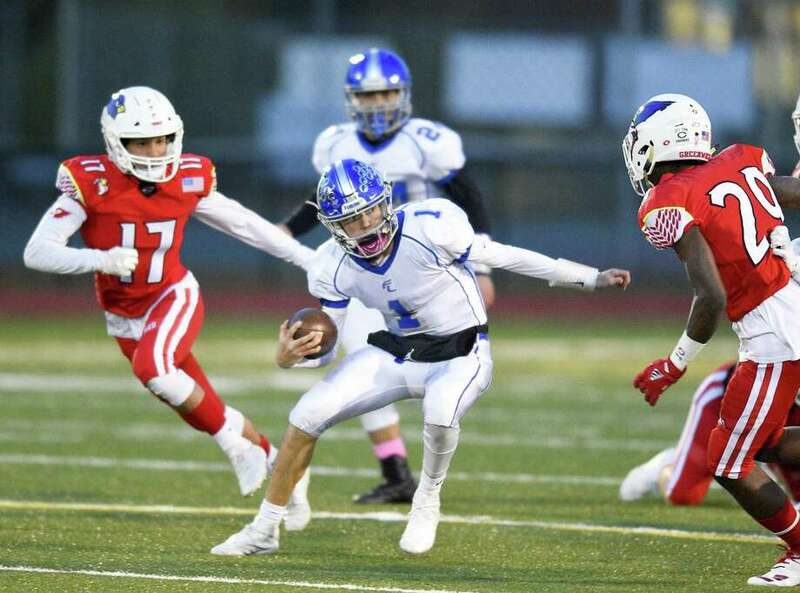 The senior Wilson is in his second season at quarterback for Ludlowe and has grown into his role as the team leader according to coach Mitchell Ross. This year, the Falcons are starting eight players who have never played high school football before with around 25 total players on the roster with no experience. The increase in participation was the first step, the second step was more of a leap as the Falcons turned what was considered a long-term reclamation project into wins in 2018. Ludlowe is sitting at 6-2 after winning three games the previous three seasons. The team is currently No. 11 in the Class LL playoff ratings and will be playing its first meaningful game in November in a long time when it hosts the No. 10 team in Class LL, New Canaan, Friday night at 6 p.m. at Taft Field. Nobody is saying the Falcons are on par with the Rams at this point but the fact there is even a conversation about it, has Ross optimistic about the future. New Canaan may be known perennially as one of the top programs in the state but it was not always that way. New Canaan coach Lou Marinelli said he recalls the struggles of rebuilding a program like Ross is now, albeit 30 some years ago. Ross said he is seeing a culture change not just among the team but throughout the school and the town. Confidence can be a coaches’ greatest tool and Marinelli said a team like Ludlowe that has won difficult games this season and has a chance to do something extra special — should it beat New Canaan — is a difficult team to get ready for. Ludlowe may not beat New Canaan Friday, but the fact this game is being talked about with state playoff ramifications should be a boost for the Falcons for years to come. If they can somehow pull the upset, the ripples will be felt throughout the state.